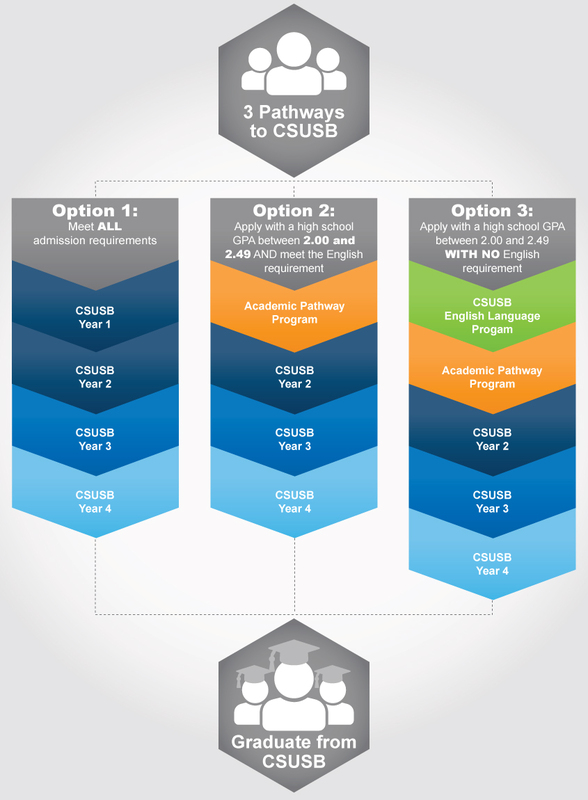 Academic Pathway Program (APP) provides a unique opportunity for international students that do not meet the high school grade point average (GPA) requirement for admission to California State University, San Bernardino (CSUSB). Eligible participants will be conditionally admitted to a CSUSB undergraduate program. Academic advising is required each term prior to enrolling in courses. Participants will receive 36 academic credits for completed courses which will transfer towards their undergraduate degree requirements. Participants that complete APP with a GPA of 2.75 or higher will be fully admitted to their bachelor degree program at CSUSB. *Test scores must be achieved within two years of application. Participants have the opportunity to enroll in the English Language Program at CSUSB to satisfy the language proficiency requirement. Visit ELP for more information. Apply for admission on CSU Apply. Pay the $55 application fee and submit all documents listed above including proof of language proficiency. International Admissions will confirm denial to CSUSB but provide Intent to Enroll letter for eligible APP applicants. Complete and submit Intent to Enroll form to iep@csusb.edu. Receive admission confirmation for the APP program. Apply for both university admission on CSU Apply and at English Language Program admission. Pay the $55 application fee and $120 application fee respectively. Submit all documents listed above. Complete and submit Intent to Enroll to iep@csusb.edu.